Use staff and student feedback to make smarter investments in digital. Finding out what students and staff think about their digital environment can be challenging. Without a clear process for engaging people in conversation about your digital infrastructure and practices, it is difficult to tell whether your organisation's investment is delivering the learning and teaching experiences you expect. Join us in Birmingham for where we'll work together to help you see the digital environment through the eyes of your staff and students. Our service provides you with robust data that can help you make better decisions about the future. Benchmarking data shows whether any issues are local to your organisation or are common to all. 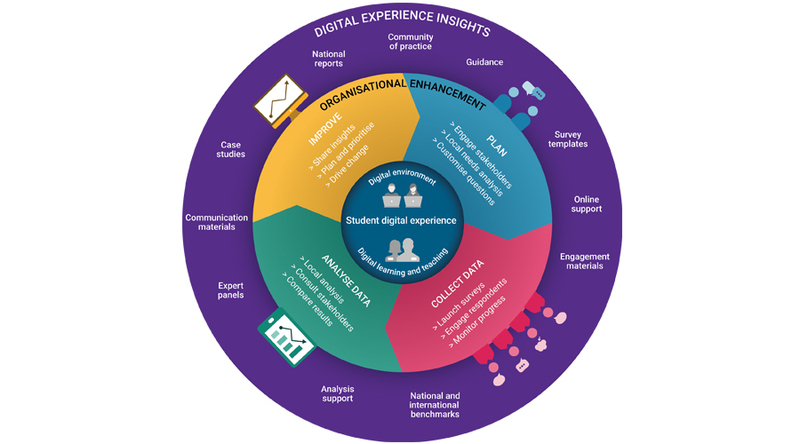 It is built on several years of work with universities, colleges and training providers developing our student digital experience tracker, an online survey of students expectations and experiences of using technology. Pilot organisations are already using the insights they have gained from students to inform their own strategic visions for digital and to ensure they invest wisely in technology and the supporting environment. Register your interest in digital experience insights and sign up to our community of practice JiscMail list to receive updates on this service.